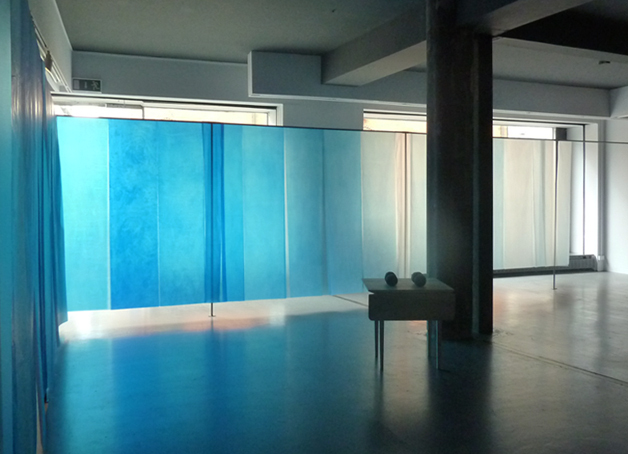 As you step into the gallery from the busy street a diaphanous blue screen leads you towards an opening at its farthest end and continues inside to form a right angled enclosure. The translucent drape (overlapping sheets of oiled and pigmented paper suspended from steel poles) makes a softly glowing perimeter, filtering the exterior brightness, and casting the contents of ‘This Attentive Place’ within a square of melancholy light. Both passage and framing device, the screen is also a work in itself, its title, The Rigid Thing, The Moving Act, as poetically suggestive as the work it contains. Though she employs a diverse range of methods and materials Caoimhe Kilfeather’s ambiguous objects are persistently doleful. A Shade is a foursome of dyed cast concrete uprights belted together with narrow bands of shiny brass. The dark slabs face each other, leaning together in secret conference, dominating the inner sanctum like a megalithic tomb or hearth. An alternative reading is that the forms are solidified shadows, negative matter cast from an absence of light (and what better material than concrete to describe this metamorphosis). Kilfeather’s work is carefully crafted. Her sensitivity to raw materials allows her complicate their natural attributes while somehow remaining true to their essence. She has made some very large works that are finely detailed (a room sized work made of woven ash veneer, Quarter, seemed to breath into the entire space of the Oonagh Young gallery in 2014) and small works that have a powerful sense of the monumental (particularly her works made from polished coal). In all these manifestations her work remains curiously reserved. It’s true again here, but this sense of something withheld draws you in, working like a magnet on your attention. The Kind Thought That Sent Them There is positioned towards the furthest corner of the reconfigured room. Four bronze spheres rest on a small wooden table. The irregular surfaces of the rounded forms appear cast from something wrapped or woven. They look like the nests of weaverbirds, or something less cosy, medieval mace-heads perhaps. In each of them a single aperture illuminates an interior we cannot see. A sculpture doesn’t have to look like something else but it’s difficult to escape comparisons. An accompanying text emphasises the artist’s interest in the gallery space itself, and her attempts to redefine it from, “an ostensibly public, to a more private and subjective setting”. (1) We are also told her work references “domesticity and habitation”. (2) If that’s correct then my preceding comments about birds’ nests and the megalithic hearth seem apt. On the other hand observations about shadows and medieval weaponry are probably way off the mark. It’s difficult to pin meanings to these works but they are sufficiently intriguing to make you want to. The use of cryptic titles is another oblique strategy. Two framed black and white photographs, At The End of His Nature (1) and (2) depict the same subject – a paved and enclosed courtyard – from the same point of view: a room leading out to the open area. If the gallery space is a reconfigured domicile (as the exhibition text suggests) then perhaps it extends to the images of exterior space framed on the wall. The image of the courtyard garden is a kind of joke, a self-consciously unconvincing trompe-l’oeil. Or does the title At The End of His Nature imply something else? Are the closed doors in the second photograph a reference to death? Kilfeather’s bookish appellations (Emily Dickinson comes to mind) are teasing, but perhaps I was led up the wrong garden path? The room’s stripped back austerity is relieved, here and there, by warmer spotlights on the walls. Slotted together by way of opposing lips at top and bottom, a vertical line of pale slip cast ceramic tiles has a simple interlocked elegance. Viewed head-on the untitled work is like an ironed-out Brancusi, a potentially endless column of starched rhomboids. Placed slightly outside the blue confines, a line-up of five small rectangles is another untitled work. Made from finely woven wire, their tightly packed surfaces gleam as though charged by a gentle current from within. “Inhabited space transcends geometrical space”, Gaston Bachelard wrote, reminding us that a space’s true coordinates are found in subjective experience. (3) While ‘This Attentive Place’ feels uniquely intimate the title suggests shared experience, and more mysteriously, that the place itself might be conscious of, and considerate towards, the work it contains. Carried in memory – habitations occur there as much as anywhere else – Kilfeather’s legacy of attention will be extended in many, no doubt, over time.